For emulating external software in a native environment there is nothing better than virtual machine. Among the variety of the virtual machines on the software market (Virtual PC, VMWare) the best solution is Oracle VM VirtualBox. Lots of useful functions, support of USB-devices and Ethernet and Wi-Fi networks, drag’n’drop mechanism, optical drives and handlers – this is far from entire list of supported by the tool functions and abilities. In this article I’m going to tell about how to set up and use VirtualBox for Windows XP for free, and how to download it and adopt to the real working environment. VirtualBox is a free open-source product with tons of handy and in time features and possibilities. With its assistance you can run any type of operational system, old or new, on your current machine without addressing to configuring the local hard disk drive and mapping the available letters to non-associated logical devices. 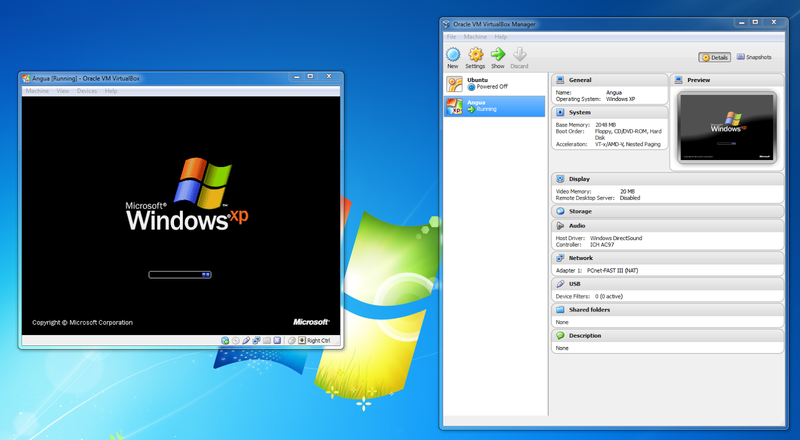 Using VirtualBox, you may emulate Linux, Unix, Solaris, FreeBSD, Mac OS X or any system from Windows family. As a result, you will be able to work with it as with your current active OS, not worrying about the absence of support of your archaic program apps by Windows 10 or 7. In XP such a situation often occurs, when your app is not run on the new release of system from Microsoft, but in Windows XP it feels free and accessible, so the only way to run it – is to virtually emulate XP on your current machine. What abilities is VirtualBox capable on? At first, the support of all types of virtual disks: VDI, VHD and VMDK. If you want to assign the precise amount of allocated space, you may stop on fixed size disk, cutting your hard disk drive on several distinct pieces. If you don’t know yet, how much space will be allocated to the storage device occasionally, give preference to dynamically allocated disk, which can increase its capacity following the increment of the required disk space. Regarding the visual part of an app, you may customize the video memory amount, allocated for selected virtual machine, as well as add the support of 2D- and 3D-Video Acceleration. In addition, there are several tweaks present, which are responsible for the video capture part. Among them are frame size, frame rate, ultimate quality of the picture while capturing, and, of course, the precise path of the file, dedicated to storing the video capture info. What concerns the controllers, VirtualBox emulator supports any types of controllers, accessible to the virtual environment: SATA, SCSI, IDE, SAS, USB, Floppy and NVMe. Considering such a wide spectrum of supported interfaces, you can be assured, that your device will be able to successfully operate on the current hardware configuration of your active machine. In Windows XP the quantity and matter of functions is absolutely the same, as on any other platform of Windows family. 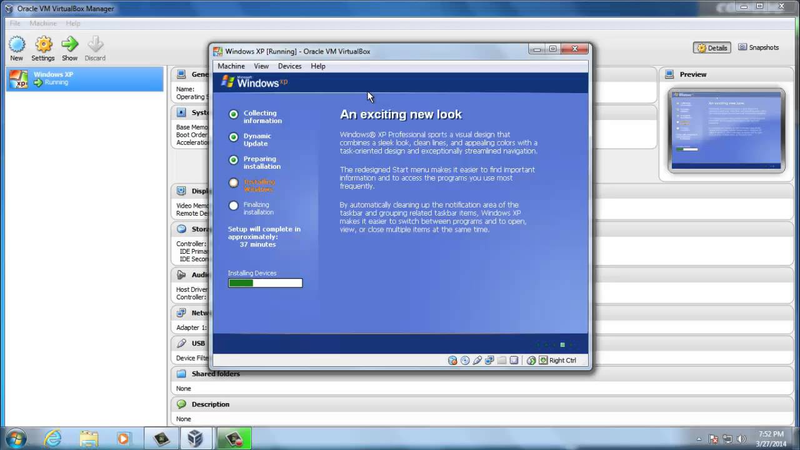 If you desire to have a look at the abilities of the program for your own, simply download Oracle VM VirtualBox for Windows XP and check out the functions of the utility personally. 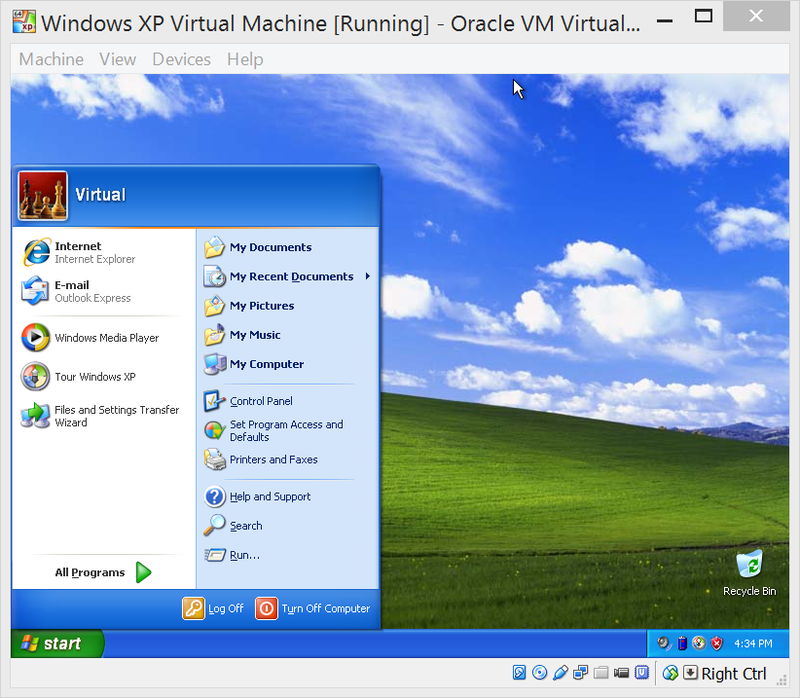 *VirtualBox for Windows XP is available for free downloading without registration. Downloads VirtualBox for Windows XP?